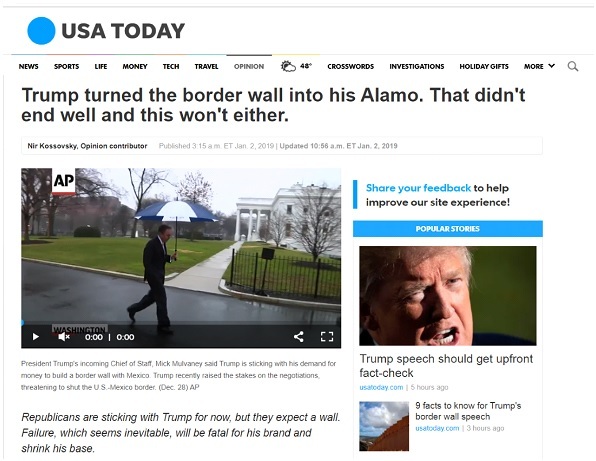 CEO of AC Client Steel City Re, Nir Kossovsky, writes opinion article for USA Today. 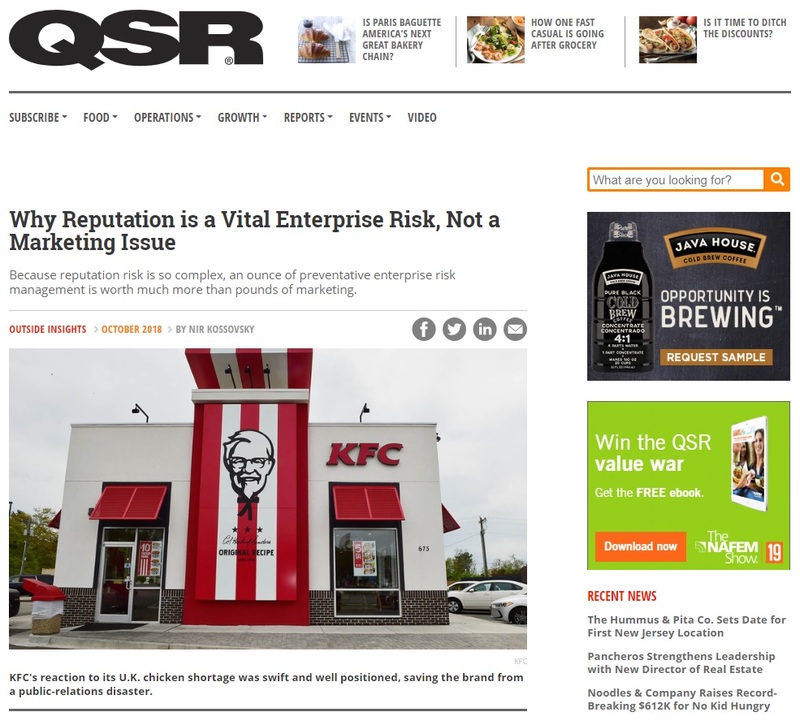 CEO Nir Kossovsky of AC Client Steel City Re redefines reputation risk and uses KFC running out of chicken as an example in his article for QSR Magazine: Why Reputation is a Vital Enterprise Risk, Not a Marketing Issue. 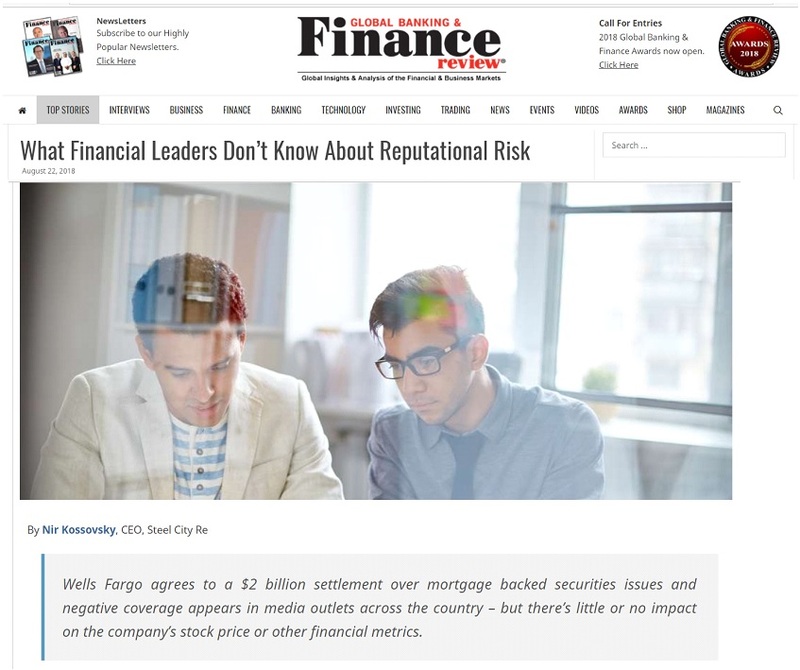 CEO of AC client Steel City Re writes article for Global Banking & Finance Review about the disconnect between negative media coverage and reputational damage: What Financial Leaders Don’t Know About Reputational Risk. Having worked with numerous law firms over the years, as well as the largest voluntary state bar association in the country, I’ve seen a wide disparity in the way lawyers perceive the potential for coverage in the media. These different mindsets are not necessarily related to whether the firm is large or small, global or local, or whether its clients are plaintiffs or Fortune 500 companies. More often, it depends on partners’ perceptions about the competitive landscape and the value of more effective external visibility in their business development and retention efforts. The most successful public relations campaigns for law firms are ones built on thought leadership rather than hype—projecting lawyers as experts on the issues facing their clients, who can provide insights into emerging trends and how best to prepare for them. Being able to comment in the media on those issues and trends—even without naming clients—provides an extra level of credibility and validation. If The Wall Street Journal quotes you, the thinking goes, you must be an expert.